A web application has to be deployed to a web server to make it accessible to users. The process of deployment is different for every application. Every application uses different technologies of different versions, and with a distinct set of libraries to achieve their functionality. They also have different types of configuration at runtime. The deployment server should have the right set of software installed to support the application. Even though cloud providers like Azure support almost every platform in the market, one might still encounter a situation that makes him or her think “That works fine on my computer, what’s the problem with this server?”. The container approach solves this problem by providing an isolated and more predictable platform. This approach got a lot of popularity due to Docker. Today many developers and firms are using Docker. This article will introduce you to Docker, and demonstrate how to deploy an Angular application in Docker and then deploy it to Azure. This article will not show how to build an Angular application from scratch. 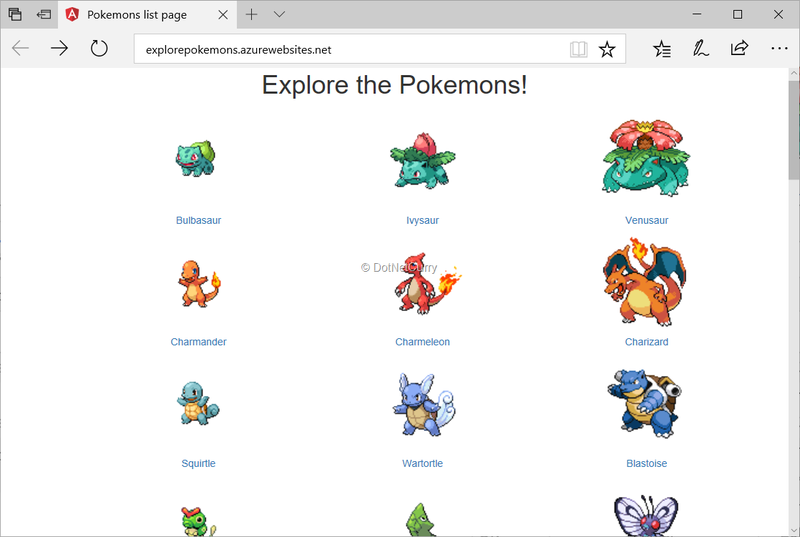 It uses the Pokémon Explorer sample built in the article Server Side Rendering using Angular Universal and Node.js to create a Pokémon Explorer App to deploy on Azure. To follow along this article, you may download the sample and run it once on your system. Docker is an open source platform that provides an environment to develop, test and deploy applications. Using docker, one can develop an application much faster and deploy it in an environment that is similar to the environment where it is developed. Because of the reduced gap between the development and the runtime environments, the application is more predictable. Images and containers are the most important objects to deal with while working on Docker. An image contains a set of instructions to setup the container and run it. 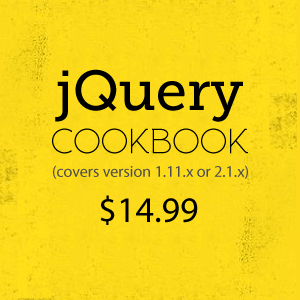 In general, an image extends an existing image and applies its own customizations. For example, an image to run a C program will be extended from an image that comes with an OS, and will install the environment required to run the C program. A container is the running instance of an image. The container is isolated from the other containers and the host system (The system on which Docker would be running). The container is created based on the Kernel of the OS on the host system. So, the container is extremely light in weight and it doesn’t contain any software installed on the host. On top of the kernel, it installs the software configured in the docker image and either uses the storage from the host system itself, or stores the files inside its own context based on the instructions in the image. The container stays in running mode as long as the program installed in the container runs or till someone stops the container. Because of being light weight, it is easy to spin up or bring down a container. The process of creating or deleting a container is much faster when it is compared to VMs. Since VMs consume a lot of memory on the host system, they require stand-alone operating systems which involve license cost and it takes time to bring them to an up and running state. On the other hand, a container doesn’t install a new OS, it gets ready within a few minutes using the host’s kernel and the only thing to be done is to install the software required for the application. Client is the command line interface used to interact with Docker. It is used to manage images and containers on the host. Docker provides commands to interact with the registry and these commands use the Docker API. Host is the system on which Docker runs. The images and containers are created on the host machine. The host contains Docker daemon, that listens to the Docker API requests and manages the containers and images. As the diagram shows, the daemon sits at the center of the client, containers, images and the registry. All the requests pass through the daemon and the results of these requests are stored on the host system. Registry is the hub of docker images. Docker Hub is the default public registry. Anyone can use the public images available in this registry. Docker can be configured to use any other registry like Docker Cloud, Azure Container Registry or your company’s own registry. If you have installed Docker, it should automatically start running in the background on your system. Check it on your system tray and if it isn’t running yet, then start it from the start menu. The list of operations performed by Docker are quite visible in the log printed on the console. 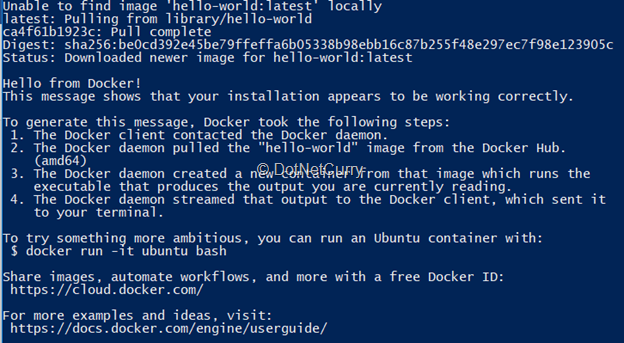 In Figure 2, Docker tried finding the image hello-world on a local machine. Since the image was not present on the local system, it pulled the image from the registry. Then it executed the commands configured in the image. The commands printed the Hello World message and the list of things that Docker checked on the system. To run it again, run the same command and now it will not pull the image from registry, as it is already available on the system. The hello-world container stops as soon as it prints the messages on the console. Let’s look at an image that keeps running unless we stop. Pull the nginx image. The -d option runs the container in detached mode. This mode makes sure the container exits when the process used to run the container exits. Now let’s deploy the pokémon explorer application in a docker container. To do so, a custom image has to be created. As the Angular application needs Node.js on a system to perform its tasks, the image has to be based on the Node.js image. As mentioned earlier, this article uses the pokémon explorer sample for the demonstration. Download it and set it up before proceeding. This sample is written for an article on server-side rendering of Angular applications so that it can be executed as a browser based application and also as a server rendered application. Open the URL http://localhost:4201 on a browser and you will see the same page getting rendered from the server. We will build images to deploy the application both ways in a Docker container. First, let’s build an image to run the Angular application on the browser. This image will be based on Node.js image, so it will have Node.js and npm installed from the base image. On top of it, it needs to have the commands to copy the code, build it and run it. The custom image to host the source code can be created using a Dockerfile. A Dockerfile is a text document that contains a list of commands to be executed inside the image. These instructions derive the image from an existing image and then perform tasks like installing any additional software needed, copying the code, setting up the environment for the application and running the application. This file will be passed as an input to the docker build command to create the image. I used http-server in the above example to keep the demo simple. If you prefer using a web framework like Express, you can add a Node.js server file and serve the application using Express. Note: Notice that the Dockerfile doesn’t have a command to install Angular CLI globally. This is because the Angular CLI package installed locally in the project can be used using npm scripts. The command for creating application bundle invokes the build script added in package.json. Now that the Dockerfile is ready, it can be used to create an image. Before doing that, Docker has to be made aware of the files that don’t need to be copied into the image. This can be done using the .dockerignore file. The .dockerignore file is similar to .gitignore file. It has to contain a list of files and folders to be ignored while copying the application’s code into the image. 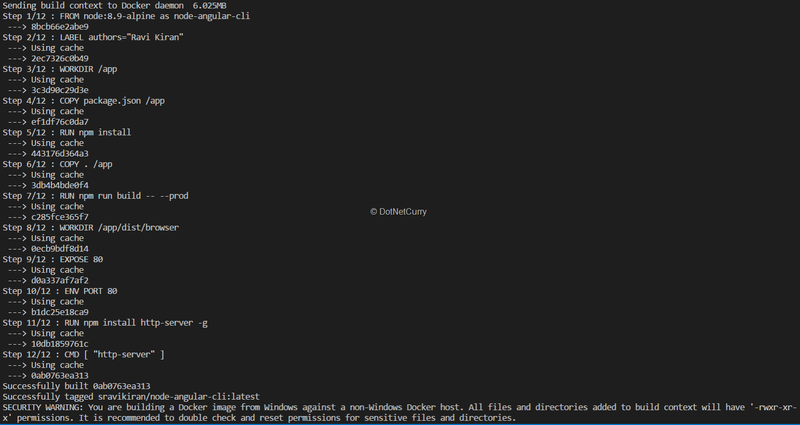 > docker build -f .\Dockerfile -t sravikiran/node-angular-cli . This command will take a couple of minutes, as it has to install the npm packages of the project and then the global http-server module. The last statement containing the CMD command is used to provide a command to execute in the container. This command doesn’t run unless the container is created. This command is similar to the command used to run the nginx container earlier. This command runs the application inside the container and makes the application accessible through port 80 of the host system. Open the URL http://localhost:8080 on a browser to see the application. Though it works, the image of this application takes 349 MB on the host system. This is because, all of the code and npm packages of the application, still live in the container. As the code is running from the dist folder, the source files and the npm packages are not needed in the image. This can be achieved using multi-step build. The Dockerfile supports staging builds. 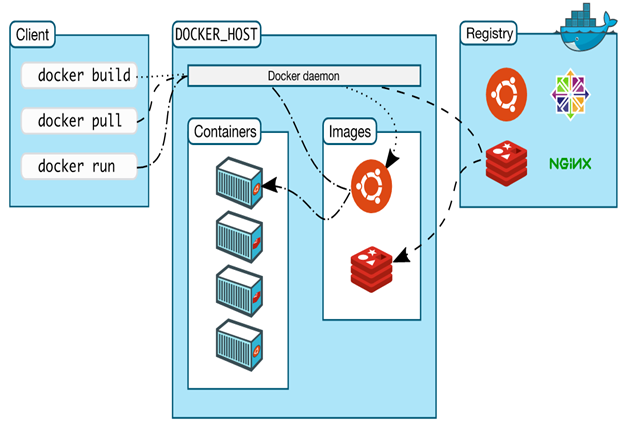 The Dockerfile can be used to define multiple images in it and Docker will create the container using the last image in the file. Contents of rest of the images can be used in the last image. The Image in the Dockerfile created earlier can be divided into two images. One will copy the code and generate the dist folder. The other will copy the dist folder from the first image and start the http-server. This command has the --rm option in addition to other options and inputs we had in the previous docker build command. This option removes the intermediate images. Otherwise, the image used for staging will stick on the host system. Check the size of this image, it should be around 60 MB, which is significantly smaller than the previous image. If you want to see both browser and the server rendered applications running at the same time, you can change the port number to a number of your choice. Microsoft Azure supports Docker very well. Azure supports container registry, which is similar to the Docker hub registry, where one can push the images and use them for deployment. Other than this, Azure also supports the Docker container clustering services like Docker Swarm, Kubernetes and DCOS. 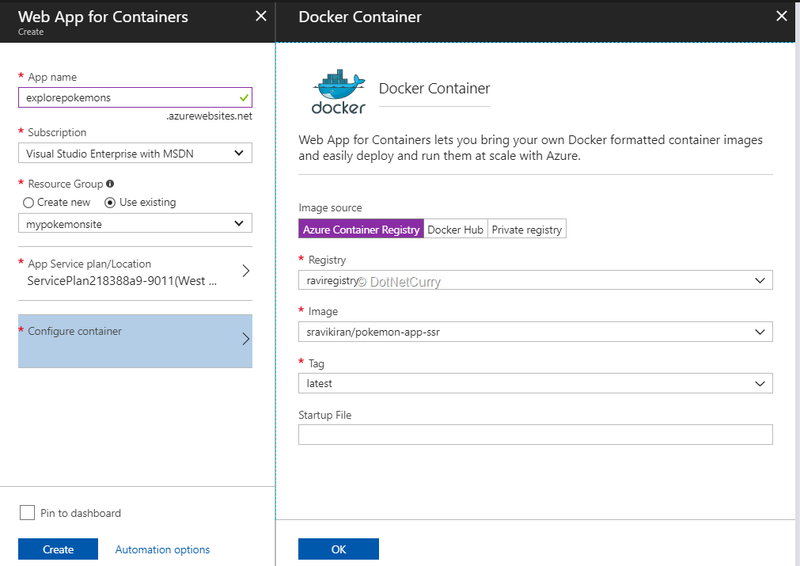 This tutorial will use the Azure Container Service to push the images and deploy them. 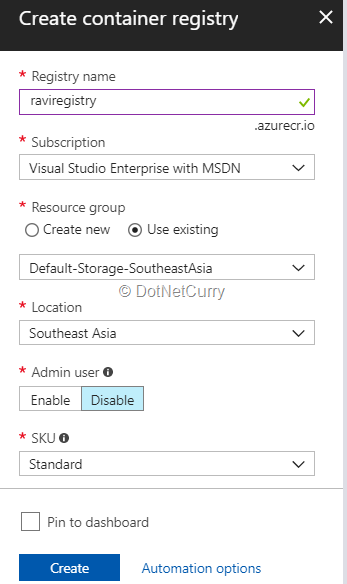 To create a Docker registry, login to Azure portal and choose New > Azure Container Registry and click the Create button in the dialog that appears. Provide inputs in the Create container registry form and click on Create. The first field is the name of the registry you would be creating and it has to be unique. Azure will take a couple of minutes to create the container. 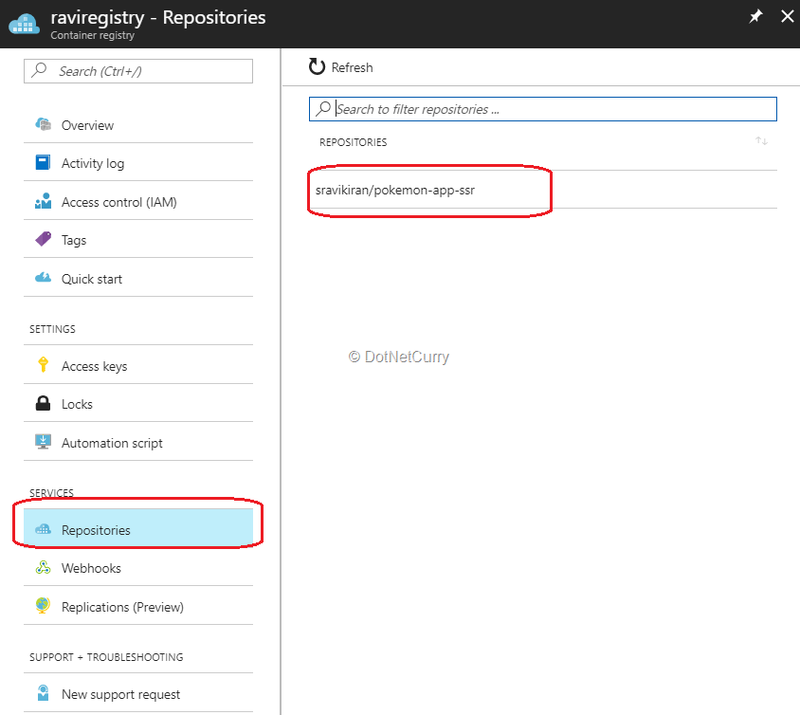 Once the registry is created, the Azure portal will show an alert and you can click on the link in the alert to see the resource. 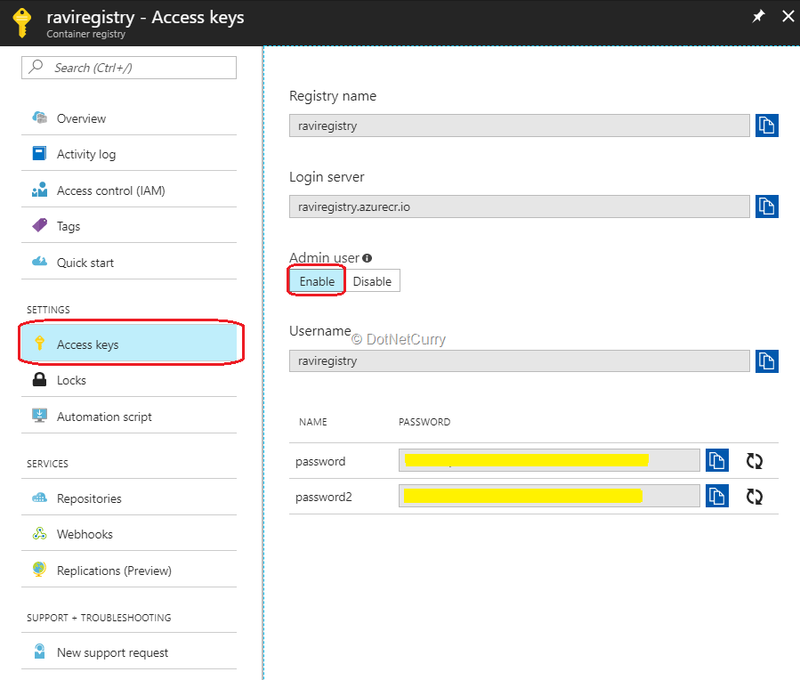 On the registry resource page, go to the Access Keys tab and enable the Admin user option. A web application can be deployed using this image. To do so, choose New > Web Apps for Containers and click the Create button. Provide inputs for the web app. Then choose Configure container and provide details of the registry, image and tag as shown in Figure 11. After filling the details, click on OK and then on the Create button to get the web application created. Wait for the deployment to complete and then visit the URL of your site. In my case, the URL is http://explorepokemons.azurewebsites.net. Once this page opens on the browser, you will see the server side rendered site. The same process can be followed to deploy the browser rendered version of the application. Docker is an excellent platform to deploy applications and Azure has an excellent support for Docker. As this tutorial demonstrated, it is very easy to take a Docker image built from an application (in our case Angular app), push it to an Azure container and get it running. This combination brings developers more control over the environment and it is also quite easy to do. Let’s use this toolset to build and deploy great applications! This article was technically reviewed by Subodh Sohoni.